Which towns in San Diego county offer a nice, walkable downtown, other than the city of San Diego itself? 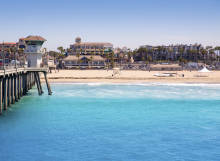 Although San Diego has a variety of walkable districts such as Gaslamp, Harborview, and East Village, there are also areas outside of the city that are very walkable. Check out La Jolla Village and Clairemont to start!